Greetings again from the darkness. It’s pretty simple. If you are a fan of UNBREAKABLE (2000) and SPLIT (2016), then you need to see this finale to M. Night Shyamalan’s trilogy. If neither of the two previous films tickled your creep fancy, then you’ll likely find nothing of interest here. The biggest fear is that fans of the first two (like me) will be disappointed and frustrated (like me) by the missed opportunity. Rather than real world super abilities clashing, we get what is mostly a silly letdown. The set-up is outstanding. David Dunn (Bruce Willis) and his now-grown son Joseph (Spencer Treat Clark) have teamed up for years in tracking down lowlife societal scumbags and teaching them a lesson. Mostly avoiding cameras (more difficult now than when he first realized his power), Dunn now has a nickname, The Overseer, and still dons his green poncho – though it’s now equipped with a headset for communication with Joseph. The Dunn men have been tracking Kevin Wendell Crumb (with a Beetlejuice twist), who has kidnapped more teenage girls and is holding them hostage. James McAvoy returns as Kevin, and his 23 other personalities (referred to as The Horde), and early in the movie we get our first Dunn vs. The Beast battle. Unfortunately, it’s brief and ends in their capture and being locked away in an institution. And this is where the fun comes screeching to a halt. It’s at the institution where we discover Elijah Wood/Mr. 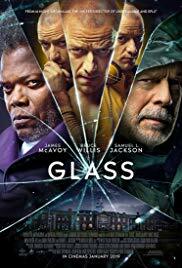 Glass (Samuel L Jackson) is also being held, and Dr Elle Staple (Sarah Paulson) is the psychologist specializing in treating those who believe they possess super human traits, be they good or evil. This misdirected plot line is our first real frustration, as we have already seen the super strength of Dunn, the massive transformation of The Beast, and the villainous mastermind of Elijah. By definition there is no suspense when we know the answer. Because of this, the entire treatment segment drags on far too long, and features entirely too much of Ms. Paulson, and too little of those we came to see. Also reprising their previous roles are Anya Taylor-Joy as Casey, the only surviving former captive of Kevin, and Charlayne Woodward as Elijah’s mother. Ms. Woodward is given little to do, and Ms. Taylor-Joy’s strong acting almost saves her from the ludicrous script … a development we intellectually understand, but emotionally refuse to accept. In fact, the script is to blame for most of our frustration here. McAvoy is again tremendous in his ability to convey multiple personalities, and Jackson, once he is no longer catatonic (never a good use of a dynamic actor), relishes his return to evil. There is an interesting use of color for the three main characters: Dunn – green, Kevin – yellow, and Elijah – purple, and the cinematography of Mike Gioulakis (IT FOLLOWS) contributes some unusual angles and views. Disney and Universal are to be commended for a rare rival studio collaboration, and M Night Shyamalan certainly deserves credit for being on the front end (with UNBREAKABLE) of the serious, dark, atmospheric superhero movie perfected by Christopher Nolan’s Dark Knight trilogy, but this film is nothing to be proud of. The film’s twist is easily predictable (and dragged out), and some parts are disappointing while some are an insult to our intelligence … and downright silly (the ending). Still, there is a certain value to closure, even if it’s a letdown. Greetings again from the darkness. With only a few exceptions, comparing any sequel to its original is a bit unfair and usually somewhat disappointing. This is especially true with the Die Hard franchise. That initial entry in 1988 is often referred to as the top of the class in the action film genre. It combined stunning action sequences, breath-taking suspense, a world class villain, and a few characters to whom we could relate. Most notably, it introduced us to John McClane, a NYC cop making a trip to California in a last ditch effort to re-connect with his estranged wife and have Christmas with his kids. McClane, as played by Bruce Willis, was a likable guy with a touch of insecurity and a terrific stream of wise-cracks. Oh yeah, he also managed to run barefoot through broken glass while outsmarting a team of high-powered terrorists looking to steal millions. Twenty-five years later, McClane (and Willis) is back for the fifth entry in the Die Hard franchise. Unfortunately, he is the only piece that bears any resemblance to the original brilliance. The action is only stunning in its level of absurdity and exaggeration. The first car chase seemingly destroys at least a third of the existing vehicles in Moscow. It does so with film editing that is likely to spur nausea and migraines among viewers. Subsequent action scenes include numerous explosions and enough gunfire and violent falls to kill off McClane and his son (Jai Courtney) at least a dozen times. Chernobyl makes for an interesting connection to the past, but falls flat in the end. Speaking of falling, McClane and Junior somehow manage to avoid paralysis or even broken ribs despite numerous falls and jumps that are just plain laughable. The only “breathtaking” suspense offered was an obvious twist among characters we can’t name with baggage we aren’t privy to. The only other significant breath was my exaggerated sighs of frustration. As for the villain, I couldn’t remember his name during the movie and we are never let in on the big secret file … only that it contains some bad stuff on important Russian big guys. This particular bad guy chomps on a carrot while performing a goofy little dance … all while threatening to kill McClane and his son. Guess what happens? You’re right … McClane doesn’t die. We know this because Die Hard 6 was announced a week before this one opened. Relating to these characters is impossible. McClane has some lame parent-regrets that don’t come across as sincere. His son is such a highly trained CIA operative that we aren’t sure what to make of him. We know he botched his mission and apparently it was because he stopped to yell at his dad for the ill-timed visit. The Russian that Junior is supposedly rescuing is bland, though he has a lovely daughter … but even she is saddled with truly awful dialogue. The only fun character in the movie is the Russian cabbie played by Pasha Lychnikoff. He sings Sinatra with a smile, even if he actually never drives the cab thanks to the traffic. It’s been a rough year for action icons Stallone, Schwarzenegger, Statham and now Bruce Willis. Maybe the action genre has been muted due to the terrific action sequences of the recent Batman and James Bond movies … each of which offer interesting stories to go with endorphins rush action . The first Die Hard had a great story and fun dialogue. Now McClane spends much of the time telling people “I’m on vacation“. When it’s not funny the first time, each successive time is just exasperating. That’s not acceptable writing and this isn’t acceptable movie directing. Director John Moore is also responsible for The Omen (remake) and Max Payne, while writer Skip Woods gave us Swordfish and The A-Team. There have to be more talented filmmakers who deserve a shot. Greetings again from the darkness. Writer/Director Rian Johnson (Brick) delivers a very entertaining, creative, thrilling and clever sci-fi film that features time travel, dark comedy, romance, metaphysics, and enough action to keep just about any viewer engaged … as long as you enjoy using your brain a bit. This one requires some assembly … and the ability to ignore the horribly distracting make-up/prosthetic/special effects used to make Joseph Gordon-Levitt look like a young Bruce Willis (he doesn’t). Source Code, the recent film from Duncan Jones, used time travel in very limited segments. In 2074, time travel is perfected, but has been declared illegal. So, of course, only crime syndicates use it. When you think about it, sending your enemies back in time to be killed and disposed of is brilliant. It’s very difficult to solve a missing person case when the body has been incinerated 30 years prior. The future mob boss known as The Rainmaker hires “loopers” from 30 years past to handle the dirty work. When The Rainmaker begins “closing loops”, he does so by sending the loopers back in time to be killed by their younger selves. Yes, somehow this works. Well it works until Seth (Paul Dano) chokes up and lets his future self escape. That doesn’t go over well with the modern day (sent from the future) crime boss (Jeff Daniels) who just can’t allow these future guys to be roaming free. Then, just like that, the same thing happens to Joe (Joseph Gordon-Levitt). His future self (Bruce Willis) appears, young Joe flubs the kill, and the next thing you know, Young Joe and Old Joe are seated in a booth at a remote diner ordering the same breakfast and staring into their own eyes. You may recall that Mr. Willis is an acting time travel expert thanks to his “trips” in Tweleve Monkeys and The Kid. It’s impossible not to compare to some other time travel movies (there have been MANY). There are certainly similarities to The Terminator, but not so much to Hot Tub Time Machine or Bill and Ted’s Excellent Adventure. It’s a tricky topic because it involves the uncertainty of how things done today might impact what has already happened. Or something like that. It would have been interesting to get more flavor from the 2074 world, since all we see is the blissful (until it’s not) presence of Old Joe and his saviour bride. Also, you have to believe that if you came face to face with the future “you”, there might be at least a brief Q&A. Plenty of fun stuff in this one, although, I had a tough time buying a blond Emily Blunt as a Kansas farmer. Her young son Cid, played very well by Pierce Gagnon, is one of the more interesting characters in the film. He is supposed to the young version of the future Rainmaker, and he possesses some unusual traits … with Blunt trying to supply sufficient motherly love to prevent him from spinning off track. Director Johnson has a knack of tossing in some dark humor at just the right time. Some of the romance seemed a bit forced, but the criminal element and the Joe vs Old Joe stuff was really fascinating to keep up with. If you enjoy movies that are somewhat challenging, and you can suspend reality for the time travel elements, it’s one that you’ll probably find quite entertaining. Greetings again from the darkness. As we get older, we expect to learn from our experiences. That’s exactly what happened here. It’s been almost two years to the day since The Expendables hit theatres. That first entry was directed, produced, written by, and starred Sylvester Stallone. This time around Sly sticks to acting and a script credit. Con Air director Simon West is now at the helm and the film clearly benefits from better action, improved characters and especially MUCH more humor … the key reason it works. However, fear not, Stallone’s face is still on screen the majority of the running time. Most of the familiar faces are back. Stallone as Barney, the leader of this pack of mercenaries; Jason Statham as Christmas; Dolph Lundgren as Gunner; Terry Crews as Hale Caesar; Randy Couture as Toll Road; and Jet Li as Yin Yang, though he is unfortunately only in the fantastic pre-opening credits sequence. Also back, after brief but funny cameos in the first, are Bruce Willis as Church, and Arnold Schwarzenegger as Trench. If somehow that’s not enough testosterone for you, the second installment also provides Liam Hemsworth as Billy the Kid, Jean-Claude Van Damme as Vilain (pronounced vi-LANE, get it? ), martial arts expert Scott Adkins, and 72 year old Chuck Norris as Booker … the “Lone Wolf” soldier. For what passes in balance in this world, the female lead is played by Nan Yu as Maggie. She is a brilliant fighter, speaks multiple languages, yet unfortunate enough to fall for Stallone (guessing that was his contribution to the script). While the story is necessarily simple, her role is vital in that she softens some scenes, while at the same time holding her own with the sea of steroid and botox stars. This time around, love plays into the story a bit more. In addition to the beautiful, intelligent, 30 + years younger character falling for his Barney, Statham’s romance picks back up, and a true love story featuring Hemsworth takes place (no, it’s not with Miley Cyrus). A couple of sequences are noteworthy. Even though it’s in the trailer, the scene with Willis and Arnold in the SMART car driving inside the airport terminal is quite entertaining. Also, the chaotic opening rescue scene finds Stallone getting shot twice, yet somehow he is immediately healed and never again bothered by something so minor. Something I found quite funny, was watching JCVD leave his sunglasses on even while filming his scenes underground in the plutonium storage facility. And, like the first one, the music seems picked to purposefully be a punchline … oh, and Frank Stallone (Sly’s brother) once again manages to gain a musical credit, right there along side Little Richard. This version is extremely likable and filled with tongue-in-cheek humor, sarcasm and wit. Sure, it’s quite cheesy and some of the one-liners are obvious and telegraphed, but it’s fun to have references to The Terminator, Die Hard and Rambo, among others. The guys are not hesitant about poking fun at themselves or each other … all the while surrounded by nearly non-stop action, gun play, missile firing and other forms of over-the-top violence and action. The body count is impossible to track, which goes right along with the extreme ammunition usage. In other words, it’s exactly what we hoped it would be! SEE THIS MOVIE IF: you are looking for some cheesy fun provided by nostalgia, wrapped in an over-the-top action film stocked with stars from the 1970’s and 1980’s. Where else are you going to get that? SKIP THIS MOVIE IF: you prefer your action movies to be more intense and reality based like “Bourne” or “Mission: Impossible”. Greetings again from the darkness. Not many people think like Wes Anderson. That’s probably a good thing in real life. It’s definitely a good thing for movies. He is a creative and distinct filmmaker, though not one with mass appeal. My two personal favorites of his are The Royal Tenenbaums and Rushmore. His previous film, Fantastic Mr Fox, was a solid hit and critically lauded. Now he delivers one that will probably only click with his core fans. It’s a thing of beauty … if you keep in mind that beauty is in the eye of the beholder. Set on the fictional New Penzance Island off the coast of New England in 1965, the movie opens with terrific visuals of the Bishop family’s lighthouse/home. Our tour is conducted as if the home were a dollhouse, and our eyes struggle to keep up with the detailed decor. We are struck by the color palette of tans, greens and splashes of red. This will continue throughout the movie. The story centers around two 12 year old misfits: Sam and Suzy. Sam is an orphan and outcast in his Khaki Scouts troop, and Suzy is misunderstood and ignored by her selfish parents, who communicate with a bullhorn and through legalese at bedtime (they are both lawyers). Sam and Suzy are attracted to each other’s misery and decide to run away together (yes, they are on an island). This ignites a flurry of activity on this quiet island and showcases two first time actors with remarkable screen presence: Jared Gilman (Sam) and Kara Hayward (Suzy). The “grown-ups” on the island include Suzy’s parents played by Bill Murray (a Wes Anderson regular) and Frances McDormand. The island police chief is played Bruce Willis, who we soon figure out is also a social outcast. The Scoutmaster is played by Edward Norton with a regimented weirdness that will have you laughing in confoundment. For such serious topics, Mr. Anderson and co-writer Roman Coppola provide us many comedic moments – both through dialogue and site gags. During the search, other colorful supporting characters get involved. Social Services is pursuing Sam. Tilda Swinton plays Social Services. In one of the few gags I’ll give away, Swinton’s character only introduces herself as Social Services. This is a gut punch to a system that is often under-staffed and forgetful of it’s true mission. We also get Jason Schwartzman as a very helpful, though slightly seedy, Cousin Ben. Harvey Keitel plays the senior Scoutmaster who is unhappy with Norton for losing a scout. Bob Balaban makes periodic appearances as a narrator … either for a documentary or for the movie, depending on the moment’s need. The script does a wonderful job of capturing how the 12 year old brain works. Some of the scenes with Sam and Suzy are almost like looking a photo album … exactly the way our childhood memory works. Flashes of moments. The Alexandre Desplat score is heavy on percussion, but it works well with the minimalistic look of the film. It’s also interesting to note that this is one of the few movies where it makes sense to have a soundtrack with Benjamin Britten, Hank Williams and Mozart! If you go to this one, keep your eyes open and moving, and your ears receptive. The payoff is worth it. Greetings again from the darkness. Well since I got pressured into posting full comments for Eat Pray Love, I figured it was only fair that I also post comments for the other half of my “Cinematic Battle of Estrogen vs. Testosterone.” The most difficult movies to comment on are those in which even the filmmakers don’t take themselves seriously. Here, Sylvester Stallone creates a movie with his tongue firmly planted in his plastic surgery-enhanced cheek. It is a bit goofy and meant to be so. The good stuff is actually pretty good, but the stuff that misses the mark is a bit painful to watch. The good stuff includes the already infamous cameo scene with Bruce Willis and Arnold Schwarzenegger. It has the single best line (maybe two) in the movie and it’s just great to see Arnie back on screen. The other funny touch is the character names: Barney, Christmas, Ying Yang, Gunner, James Munroe, Toll Road, Paine, Hale Caeser, and of course, Tool. More work might have gone into the character names than the balance of the script. The parts that don’t work include the lame one-liners that Jason Statham is forced to recite throughout. Also, after all these years, Stallone remains in love with his own face. I believe he is off screen for a total of 3 minutes. And enough with the Jet Li short jokes. One was plenty. We could have really used more of Terry Crews. He lights up the screen when he starts his trail of destruction. Mickey Rourke, Dolph Lundgren, Steve Austin, Eric Roberts, Randy Couture and David Zayas all have their moments. But therein lies the problem. Just can’t do justice to so many characters … or is it caricatures? This one is exactly what it was meant to be. Don’t expect the world’s greatest action film. Think of it as more of a Tribute Film with non-stop stunts. Oh and a blasting version of “Mississippi Queen” by Mountain with Leslie West.